Business Insider/Mary HanburyVictoria’s Secret employees say its products are easy to steal. Shoplifting is a common pursuit at Victoria’s Secret, according to nine employees who spoke with Business Insider. But employees are instructed not to accuse, approach, discuss, or point out shoplifters in any way. Those who do so risk losing their jobs, several employees said they’d been told. This policy is in place in part to help protect employees from shoplifters who may be aggressive. According to the National Retail Federation, organised retail crime is on the rise, and shoplifters are becoming more aggressive. Do a simple Google search for “Victoria’s Secret shoplifting,” and you’ll find dozens of wild stories documenting shoplifting incidents at locations of the lingerie retailer across the United States. Some employees said that shoplifting had become so common at some Victoria’s Secret stores that it was no longer surprising to them. “It’s so normal, it’s ridiculous,” a bra specialist who works in a Victoria’s Secret in South Florida told Business Insider, adding that she sees shoplifters in the store daily. “When I first got to this mall, I was like, ‘Oh my God, this is crazy,’ and now I am like, ‘Oh, OK, it’s Monday,'” she said. She said that despite the frequency of shoplifting in her store, she’s not able to do anything about it. That’s because Victoria’s Secret has a strict policy where its employees are instructed not to accuse, approach, discuss, or point out shoplifters in any way. Those who do so risk losing their jobs, five employees, who asked to remain anonymous for fear of retribution, told Business Insider. In total, Business Insider spoke to nine current and former employees who have worked in various Victoria’s Secret stores across the United States. A representative for Victoria’s Secret confirmed to Business Insider that sales assistants are instructed not to approach shoplifters directly. Employees are asked to be observant and alert the asset-protection team, a security unit that works with police to file charges, about any incidents. In larger stores, there could be a loss-prevention team member who works for Victoria’s Secret’s parent company, L Brands, though they wouldn’t necessarily be visible to shoppers. In smaller locations, this person might drop by twice a month and hole up in a back room, watching live video footage of the store. Some stores also have a security guard at the door. Business Insider/Mary HanburySome larger stores have security guards by the door. Sales associates are told to note the time and location of a theft and report it to their manager, who can alert the asset-protection team. Several employees said their managers had told them they would be fired if they did not follow this policy. A Victoria’s Secret representative declined to comment on this. “No matter how much they take or how many shoplifters there are, we will be fired if we do not follow policy,” Anicya Galindo, a former employee who worked at a Victoria’s Secret in Pacific View Mall in Ventura, California, told Business Insider. Galindo said she was fired last month, after working for the company for three years, for violating the store’s attendance policy, turning up a few minutes late to work on several occasions. But she argued that she was dismissed unfairly, saying she was led to believe there was a six-minute grace period for late arrivals and was not told about her violations when they occurred or given any warning before her firing. She described it as another example of a store policy that was confusing to her as an employee. It turns out Victoria’s Secret has a common approach to shoplifting – it and other stores, like Walmart and Macy’s, have policies designed to not only protect employees’ safety, but prevent situations where a customer could be falsely accused of shoplifting. A representative for Walmart said in a statement emailed to Business Insider that “any associate not specified as an authorised associate that witnesses or is made aware of suspected criminal activity or violence within a facility should report the incident in question to a member of Walmart Asset Protection or a member of management.” The representative would not comment on whether employees risked being fired if they did not follow this policy. Galindo said shoplifters would sometimes come into her store, steal items, and then walk up to the register demanding a refund. “Because we cannot discriminate or accuse, we are required to give the refund at the lowest selling price on a gift card,” she said. Target has had problems with this in the past. In June, a loss-prevention agent was fired after a woman was falsely accused of shoplifting and paraded through the store in handcuffs; an attorney for the woman alleged she was racially profiled. In 2015, more than half a dozen employees told Business Insider that Target had a practice of parading workers through stores in handcuffs to discourage theft and other infractions. Target denied that it had any such policy. But some workers say that refusing to address shoplifting could create an uncomfortable working environment. “The ease of access to stealing merchandise and even returning it for profit has caused associates to stop taking their job seriously and also even made observing customers feel that we are a joke,” Galindo said. Some retailers have enforced these policies more strictly as shoplifters have become more aggressive, experts said. “We are not [talking] about the individual shoplifter who may come in and steal something for what they perceive as a personal need,” Robert Moraca, the vice president of loss prevention at the National Retail Federation, told Business Insider. Moraca, who is responsible for directing the NRF’s loss-prevention research and initiatives, described organised retail crime as a new trend affecting the industry. This type of crime, which includes things such as professional shoplifting, cargo theft, and returns fraud, costs retailers an average of $US726,351 for every $US1 billion in sales, the NRF said in a recent report. Moraca said that groups of shoplifters were increasingly coming into stores and in some cases quickly swiping the contents of an entire shop floor. He pointed to a YouTube clip from 2015 in which several people appear to rob an Ulta store, taking almost all the inventory on displays in minutes. Business Insider/Mary HanburyMany Victoria’s Secret items don’t have electronic tags. 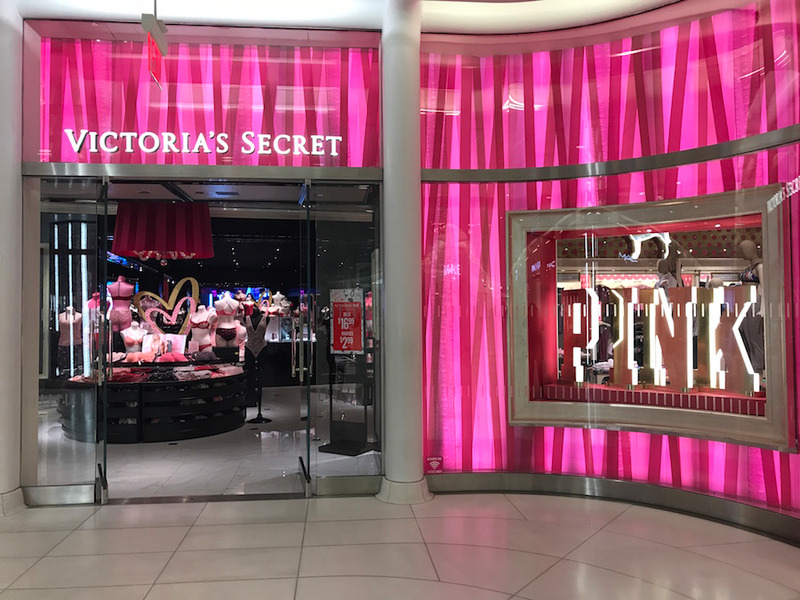 While Victoria’s Secret might lend itself well to theft – its products are generally small and light, and many don’t have electronic tags, meaning thieves can walk right out the door with them – it’s not alone in facing these issues. According to the NRF, shrink – a loss of inventory related to theft, shoplifting, error, or fraud – costs retailers 1.33% of sales a year on average and cost the US retail economy $US46.8 billion last year. The issue has been exacerbated by the prevalence of third-party selling platforms, such as Facebook Marketplace and eBay, that make it easier to sell stolen items. “These platforms serve as a fence for stolen product, attracting habitual shoplifters who exploit the anonymity of online platforms to conceal their identity and operate what amounts to an illegal business from a mobile device,” Jason Brewer, the executive vice president of communications and state affairs at Retail Leaders Industry Association, told Business Insider.